First of all, don’t let the word “fiery” scares you away because it’s always up to you how “fiery” you want this cocktail to be. 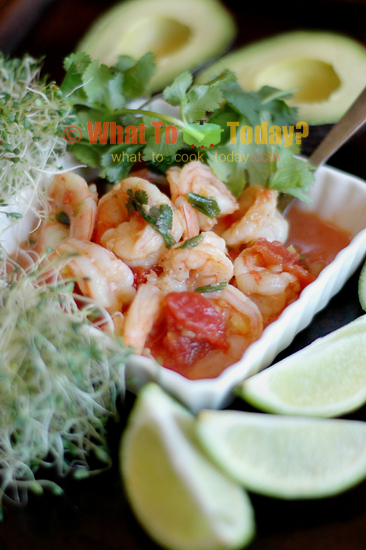 I can’t say enough good things of this fiery shrimp cocktail recipe I made the other day. I’ve never really a big “fan” of shrimp cocktail myself. Perhaps that’s because I had not really tasted a good one. I can’t stress enough how important it is to use fresh high quality seafood when it comes to making seafood cocktail. Honestly, I don’t like shrimp cocktail using store-bought cooked shrimps. That’s just me. The shrimps are simply not the same. 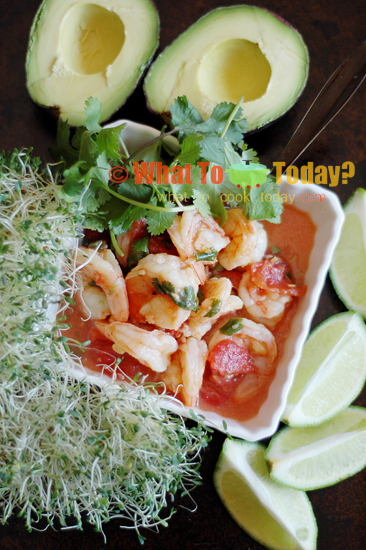 This fiery shrimp cocktail is so delicious with tomato sauce and herbs like cilantro and eating it with alfalfa and avocado really hit the note! So very delicious! gosh!! !